A Canadian Security Intelligence Service assessment highlights a renewed sense of indignation among protesters and clearly indicates the spy service's ongoing interest in anti-petroleum activism. Civil liberties and environmental activists questioned the rationale for CSIS's interest, given that opposition to the pipeline project has been peaceful. "While we cannot publicly disclose our investigative interests, we can say that it is important for the service to pose important analytical questions on these types of issues, such as the question of whether developments such as the purchase of a pipeline could give rise to a national-security threat to Canada's critical infrastructure." The CSIS brief characterizes resistance to the pipeline project as a "developing intelligence issue." "Indigenous and non-Indigenous opponents of the project continue to highlight the increasing threats to the planet as a result of climate change and the incompatibility of new pipeline and oil sands projects with Canada's 2015 commitment under the Paris Climate Accord," the brief says. "At the same time, many within the broader Indigenous community view the federal government's purchase and possible financing, construction and operation of an expanded bitumen pipeline as wholly incompatible with its attempts at Crown-Indigenous reconciliation." The pipeline acquisition and commitment to complete the project is therefore "viewed as a betrayal" by many within both the environmental and Indigenous communities, CSIS says. "Indigenous opposition at the grassroots level remains strong. In response to the federal purchase, numerous Indigenous and environmental organizations have restated their commitment to prevent construction." The brief singles out the Treaty Alliance Against Tar Sands Expansion, noting it has signatories from over 50 North American First Nations in its bid to halt the project. It also features a May quote from Canadian environmental organization Stand.earth that the decision "will haunt the Trudeau government." 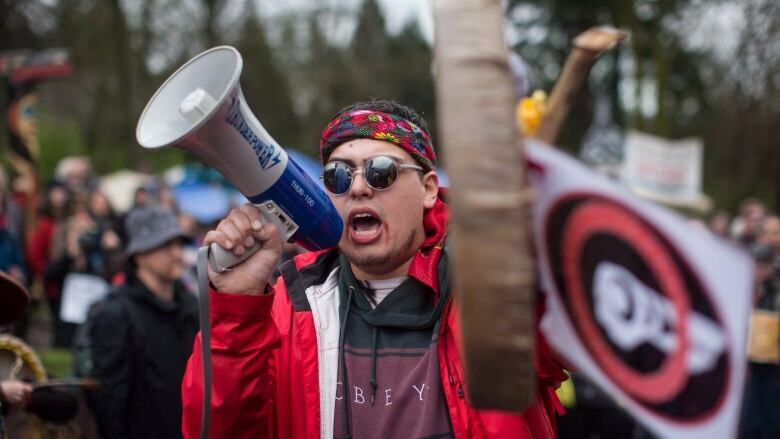 The CSIS brief notes there had been "no acts of serious violence" stemming from peaceful demonstrations and blockades at Trans Mountain facilities in British Columbia that resulted in the arrest of more than 200 people, or at smaller protests across the country. However, the document includes a section titled "Violent Confrontations and Resource Development" that mentions past conflicts over shale-gas development in New Brunswick and a high-profile pipeline in North Dakota. It is unclear, because of the redactions to the document, exactly what CSIS was looking at, said Josh Paterson, executive director of the British Columbia Civil Liberties Association, which has expressed strong concern about the spy service's monitoring of activists. "While some opponents of the pipeline were arrested during protest for breaching a court order, that was a matter for police and the courts, and was done out in the open — it should not be a matter for our spy agency." "I'm not sure why they're trying to draw that connection with violence," Hansen said. "I'd be interested to know. But it's certainly not our intention to ever pursue violence."